Historically, our agency has roots dating back to 1911 when it began as First Insurance Agency, a division of First National Bank of Ft. Morgan, located next door at 231 Main Street. 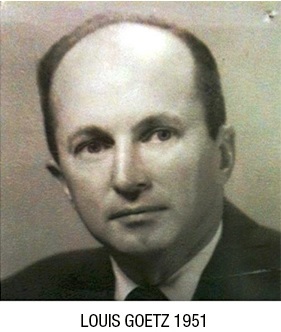 In May, 1951 Roydan Brown, President of the bank contacted Louis Goetz in Louisville, KY (via an Aetna field man from Denver) to interview as manager of the bank owned agency. Brown also offered 50% ownership of the agency as an addition incentive. In 1951 Loiuis Goetz was at a crossroads in his life. He was 42 and had worked for Hartford Steam Boiler Ins. Co. for 26 years. He had a three state territory to cover so he traveled Monday through Friday for three weeks every month. His family was relocated by Hartford every seven years. He could see no prospects for promotion as he had no college degree, so the ownership opportunity appealed very strongly to him. In the summer of 1951, Louis and his wife Lucy together with their two children Barb (16) and John (13) drove across the great plains to visit Denver, Ft. Collins and Ft. Morgan where Louis investigated agency ownership opportunities. On January 15, 1963, Louis incorporated his proprietorship value into a corporation. He created Goetz Insurors Inc. where Louis was President; Lucy, Vice President and John, Secretary-Treasurer. These officers remained the same until Louis and Lucy passed away. In June 1967, First National Bank moved to its new building at Kiowa and State Street. Virginia Johnson sub-divided the open space of the bank into several office suites. Goetz occupied the front two offices, about 1/4 of the total space. Goetz would eventually grow to occupy the entire 231 Main St first floor and would remain at this location for 24 years. In 1997 Lucy died at age 90 and Louis continued to come to the office regularly until he broke his hip in 1999. He died in 2000 at the age of 93. John Goetz retired in 1999 and turned control of the agency over to Allan Goetz and Gina Keenan-Heepke (two of Louis’ grandchildren.) Gina retired in 2014. Allan Goetz remains the active president of the agency and owner of the 231 Main Street building.